Leg or paw injuries are very common in urban coyotes — I see them all the time. Most that I’ve seen are the result of dogs chasing them: legs get twisted, pulled, or even dislocated and broken as they try to get away in an urban environment. I’ve also seen several instances of this resulting from coyote/coyote interactions. Before I even knew that this coyote was injured, I watched his caring mate investigate the severity of the leg injury. Coyotes apparently investigate through their noses more than their eyes: she sniffed the leg intently. We’ve all seen our canine companions sniff each other to find out about each other, and I’ve read about dogs who can actually sniff a two-degree temperature change in humans (which happens just before an epileptic episode), so this kind of investigative sniffing is very understandable. Their eye-to-eye gaze afterwards, in the photo below, appears to show that each understood what was going on. Then the female did her best to get the injured male coyote to follow her to a safer area. She tried her darnedest: she poked and prodded and pushed with her paw, her head, and her whole body. He complained and rebelled with a gaping show of teeth, but eventually he gave in a little and went with her, even if only for a short distance. 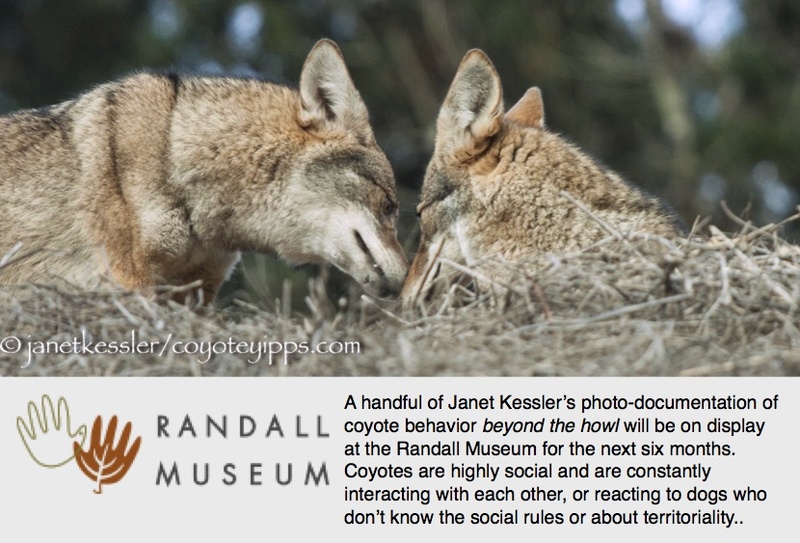 I posted a similar instance of this type of prodding to get a mate to do something, see Coyote Communication: An Example. Shortly thereafter, always looking out for him, the female noticed active dogs nearby. She immediately hurried over towards the dogs to divert any potential pursuers (that’s her rushing off at the beginning of the video). None came his way. “Altruism, in the biological sense, refers to a behavior performed by an individual that increases the fitness of another individual while decreasing the fitness of the one performing the behavior.”[Wikipedia] She was clearly placing herself at a greater risk for being pursued while reducing his risk. Later on there was more intimate contact between the two coyotes, as seen below, but I couldn’t tell if she was still trying to move him away from the area, or simply nuzzling him: this contact lasted only a few seconds, so I think it was simply a nuzzling. When I arrived on the field, I noted that this coyote preferred being off to the side by himself and not interacting with any of the other members of his family. The rest of the family was in the distance, galavanting around together as usual at their evening rendezvous. This made sense a little later on when I saw him follow the others from afar with a very heavy limp. It was his front left paw or wrist which was affected. Staying apart showed the others that he needed a buffer zone for protection and could not interact in their normal roughhousing way. He was mobile, and that is the factor for deciding if intervention is appropriate: it’s important never to intervene unless absolutely necessary: any kind of capture is extremely traumatic for a wild animal — they become terrified for their lives, as relayed to me by a wildlife rehabilitator, but also removing a coyote from his family would be stressful for the entire group. As it turned out, within a couple of days he was back to normal. I’m supposing that he picked up a thorn which became embedded in his paw, or he twisted his wrist on uneven ground, but I’ll never know for sure what happened. The other coyotes seemed to understand what an injury was all about — they respected his need, looking over at him occasionally. Only Dad, several times, trotted back to make sure his yearling son was okay, to be with him, and to comfort him with some affection and grooming, as you can see in the photos below. It was sweet to watch. I’m convinced that there is an awareness in coyotes beyond what most humans are willing to accept. And this particular Dad is more apparently concerned with looking out for the welfare of each member of his family than most. Injuries to legs are not uncommon for coyotes. They have very light bones and joints, and sinewy builds, which constitute the perfect architecture for their needs: quick movements, speed, sustained movement. At the same time, the light, thin bones are more susceptible to injury and twists. That’s the tradeoff and it’s why you’ll see leg injuries in this species. Nonetheless, it’s always upsetting to see an injury in a coyote — the initial reaction is to wonder which way it might go, in addition to wondering exactly how the injury came about. Photo of the coyote hanging out the previous day. The injury was first noticed the previous morning. I was told that it was a bad limp — the devoted neighbors were worried and concerned for his safety and his life: “What should we do?” I advised that, if the coyote was mobile, he should be left alone — he would be okay. I went out before dawn the next day to assess the extent of the injury and exactly what was injured: be it paw, leg, joint, or hip, along with the coyote’s demeanor and mobility. I spotted the fella and his mate right off, foraging in the bushes. Well, he was very mobile, and his disposition was great. In fact, he was more concerned about his mate than about himself! This was ever so sweet to see. When I first encountered them, SHE ran off to stay hidden, after which HE spent time looking around for her, found her and ran to be with her. She is much shyer than he is. They then both walked together for a stretch, but as dawn broke and people started to gather, she hurried down a little used street to keep away. He watched her go, staying back so that HE would be the attractant and not her, thus allowing her to slip away undisturbed. As he watched her go, he gingerly walked on his leg a little but did not put much weight on it when he stood still. Then, when she was almost out of view, he hurried along after her: this is when the limp became noticeable: at a faster pace, he had to hold up his injured leg. So, as the video shows, he’s quite mobile, and he has not lost his spirit, indicating that he was taking care of himself just fine. It’s always best to allow wild animals to heal on their own: nature is a marvelous healer if you allow it to do its magic. Intervention is not necessary here, and in fact could do more harm than good. The process of intervening would be traumatizing not only to the injured coyote, but to his entire family which depends on him as the leader and authority figure for his family — it would be extremely disruptive for them to find him gone. Intervention may indeed be needed sometimes, but more often it is not necessary. We’ll keep an eye on his improvement over the next couple of weeks to make sure he doesn’t regress. I’ve seen lots of leg and hip injuries. Every one of those I’ve seen has resolved itself pretty quickly except one, which simply took longer — several months. THAT coyote had been hit by a car. I was lucky enough to run into an eye-witness of the accident. The witness wanted to help the coyote but the coyote slipped away and they could not find her. It turned out to be a good thing because, months later, we discovered that she was raising two pups as a single mom. They would have perished without her. We knew that her mate had been killed before the pups were born, apparently by rat poison. This speaks volumes for coyotes’ resiliency: normally both father and mother raise the young. Here is another bad hip injury which resolved itself in a couple of days: Injured coyote – collapsing hip and leg. UPDATE from three days later: Good news to report! The injured fella has been walking AND trotting solidly on all fours, in addition to howling with the sirens. Injured animals tend to remain quiet and under-the-radar for a while, but this coyote’s injury clearly is no longer hampering his style. Yay! Please don’t leave your trash lying around! It could injure an animal, even if it’s something as simple and seemingly-benign as a hard plastic container, as seen here. There’s enough out there that these animals have to deal with without having to deal with our made-for-human toss-offs. This coyote found and chewed on a hard plastic vial. A piece of the hard plastic splintered off and could have become stuck in the coyote’s mouth, possibly lodging between her teeth or in her gums, creating discomfort and maybe an injury more severe than mere discomfort. She used her paws in attempting to dislodge it. Pets are often taken to the vet for items that become lodged in their mouths, throats or stomachs. Wild animals don’t have this option. 3″ hard plastic splintered by the coyote’s chewing. At first glance, it looked as though she was dealing with a paw or an eye injury, but notice that she used both paws and continually brought them to way back of the jaw on both sides. And this behavior happened right after chewing that piece of hard plastic. She worked hard to dislodge the uncomfortable or painful item, standing there patiently as she did so, but I have no idea if she was successful. When an animal can’t “fix” something like this, they learn to live with it. If she didn’t get it out, maybe her body will somehow expel it: nature can fix many things. But what if it doesn’t? We can prevent many of these occurrences simply by picking up after ourselves. Unrelated to this story, but of interest, is this story involving my brother’s dog. Several years ago my brother’s Golden Retriever began avoiding him, slinking into a corner for several days before my brother forced the issue and discovered a substantial piece of metal wedged around his dog’s teeth. The dog apparently was fearful of being ostracized for this new *malady*, preferring not to be seen rather than asking for help. In the wild, many animals are shunned from their social groups if they look or act odd. Might the dog have been fearful of this? This is Molly. Molly was running in an open field when her foot got caught in a gopher hole. She began limping. Her owner took her to the vet where they learned Molly had sprained a ligament in her arm. After about four days, with rest and time, the limp slowly wore off and Molly went back to living as she had before her injury. Injuries that are common to dogs are also common to coyotes. But time and rest are not so available to wild animals who must continue to hunt and protect themselves, come rain or shine or disease or injury. It’s why most coyotes don’t live beyond about 5 years of age on average, even though their full natural life span could be as long as 14 years. Dogs, of course, with state-of-art medical care can expect to live out their lives almost to the end of what is genetically expected for their breed. Humans, too, are aided by state-of-art medical aid. Only a couple of generations ago, if a human fell and broke a hip or injured a knee or broke a leg, it was “the beginning of the end”. You lived with your injury, hobbling around with a cane if you were lucky. Being bed-ridden was the clincher — it caused pneumonia, atrophy and all sorts of other problems which often led to a premature death. Luckily, this isn’t so anymore. I’m having my turn at this now. Scrambling around the parks doing my coyote observation work — in fact, doing what any other coyote or dog might be doing in a park — I myself sustained a debilitating injury: I was hurriedly descending a steep incline covered with tangled brambles. I didn’t trip in that booby trap, but I must have come down wrong on the leg or twisted it as I descended ski-fashion. I could feel something was wrong, but it didn’t hurt much at first, so I pushed my luck rather than take a break. I should have done what Molly did. Instead, I continued, like a coyote. Within a couple of weeks, as I walked carefully so as to avoid pain, I heard a “POW” and fell to the ground — I could not walk another step and the pain was excruciating. It was already dusk. I wondered how I would get out of the park. I was too proud to scream for help. So I found two sticks to lean on and inched my way out of the park — about 500 feet took me over an hour. X-rays showed I had perfect bones — I was told to wait it out. But my friends all told me to demand an MRI. I finally did, and discovered that my meniscus was a mess of rips and even the root was torn apart. Dogs and coyotes also have meniscus injuries. My prognosis: knee replacement within a year if I didn’t have the meniscus repaired. Isn’t that called Hobson’s Choice? I had state-of-the-art surgery and had to remain off the knee for six weeks. I wore a full-leg-length brace and hobbled around on crutches, with the warning words ringing in my ear, “You have one chance at this — the minimal tissue in the root won’t allow a second repair — if you mess it up, you’ll have to have knee replacement.” When you live for being out-of-doors, it’s excruciatingly difficult to take “time out”. Fortunately, my hiatus is up. I’ve missed only the coyote mating season. I’ll be out there observing within the week, though full recovery will take many months. I’ve been thinking about coyote leg injuries. Coyotes can’t afford to take an extended “time out” to heal, nor do they have doctors to help the healing process. But they do have four legs instead of two which allows them some “wiggle room” for recovery. I was just sent a video of a coyote using three legs. Although the coyote was somewhat hampered, he was not incapacitated, and he kept up with the other coyotes. 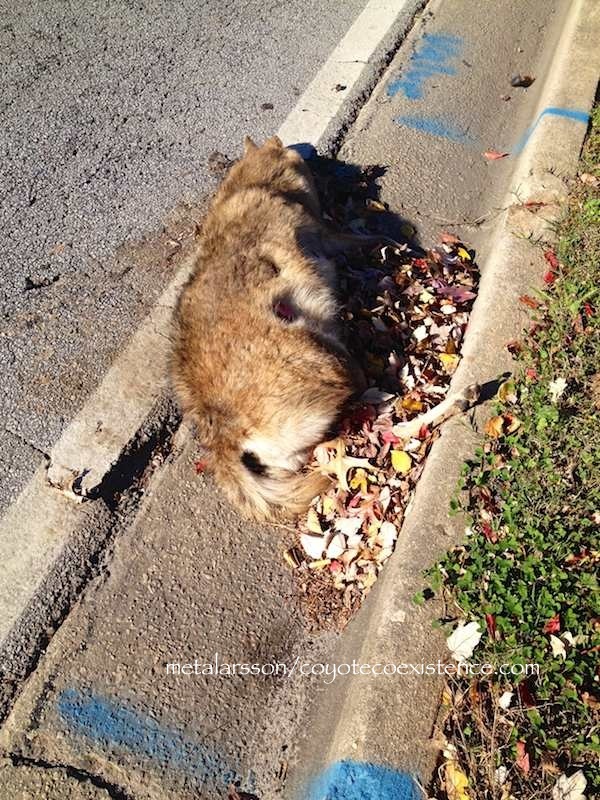 By far, the most common killer of urban coyotes is cars — these amount to 40 to 70% of urban coyote deaths each year. Vehicles can be thought of as urban coyotes’ number one “predator”. This is not surprising because coyotes take long daily treks through vast urban landscapes which include an extensive grid of roadways. In addition, a car may not kill right away, but instead may permanently maim and produce injuries which make life that much more difficult, ultimately shortening the coyote’s life. A coyote’s full potential lifespan of about 14 years (they live this long in captivity) is usually reduced drastically to an average of around 3-5 years in the wild, though some individuals beat the odds and live a little longer. Coyotes also die from malnutrition and diseases such as mange, and in rural areas, a huge number are shot for no reason at all except that they are coyotes. A coyote’s life is not easy. By the way, cars are also a primary killer of pets: over 5.4 million cats are killed each year by cars and over 1.2 million dogs are killed each year by cars. Interestingly, dog bites to other pets are the third largest injury to pets — coyote injuries to pets is dwarfed by these statistics.